Taking photos of nails is so difficult, as my camera is so heavy and I refused to use the tripod. Will do next time, note to myslef. I don't often do nails of the day, as I find it so difficult to photograph my hand, hate the way it looks in photos. My fingers look so short, whereas they are normal length. BTW, some of my nails had been broken while taking the photos, need to wait until they will grow back. Okay, I will stop rambling now. 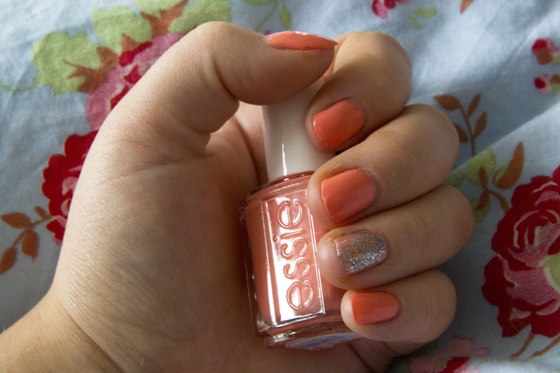 I'm big lover of Essie nail polishes, I'm so happy that they are now available in Boots and Superdrug. As I love looking at the colours in person. I have two Essie nail polishes with the old thin brush, which I hate! Takes for ever to paint my nails, the new version with the bigger brush is so much better. Haute as Hello is such a pretty coral orange, that's how it's looks in the bottle, on the nails I would say it looks like light orange. I like colour like this during summer, as they look so nice on tanned hands. The Haute as Hello has the thin brush, such a pain! It's so difficult to make it look nice on the nails, as thin brush leaves me with lines. So I had to paint my nails with 3 coats, normally two is enough with normal brush. The colour is very well pigmented. Last on the nails without a top coat for 2 days, with extreme use (like lots of washing, house work etc.) With good top coat you can pull it up to 4+ days. That's pretty good I would say. I do like the colour but I think Tart Deco would be more ME colour (I will add it to my collection when I will use up at least one nail polish). OPI is one of my favourite nail polish brand. The colour range is amazing, I wouldn't mind owning all of the colours. I love the names they call their nail polishes. This is OPI effect nail polish, which I really like to use on one finger, just like I did on the pictures above. I love glitter nail polishes, but I hate removing them, such a pain. This nail polish contains little pieces of glitter and line flakes. I think this nail polish had been a part Nicki Minaj collection. I really like to use it to achieve different effect, if you layer it up it will look like a normal glittery nail polish, when you will use one layer it will be very gentle on the nails. 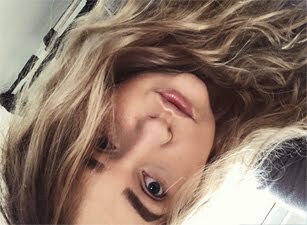 However I went for two layers. It's not only silver it also contains some blue,yellow, green, red and many more colours, depends on what light you will look at it. It dries really quickly. i've never tried the old essie ones, but the brush on the new ones are amazing, covers the whole nail :). i agree, nail pictures are the hardest, i can't keep the camera still! Ooo they look so good together! So pretty! I havent tried essie yet. 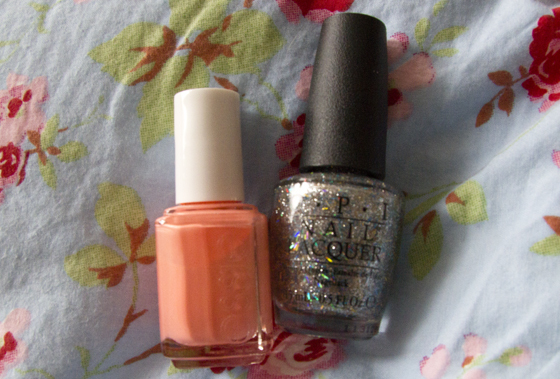 These look so good, both polishes look very pretty! Wow, I love both those colours!! 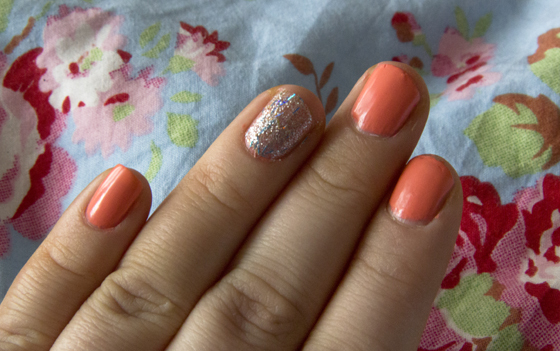 The OPI glitter is great but the orange shade is very nice too! Might be adding these to my wish list. I have a ridiculous obsession with nail polishes already don't really need more but these are too nice not to get! haha!